Make a wish, dad , was what Michael said to me. I imagine I was wishing the wrong kind of things, because all I was hoping for was for the dandelion and his lips to be in the plane-of-focus at the same time :-). Details: Nikon 105mm 1:2.8 macro, ~f/5.6, 1/125s, ISO 200. I am an interior design student creating a concept board for a children's retail clothing store design project for school. The concept board consists of images, words and sketches to illustrate how the store design will look and feel. 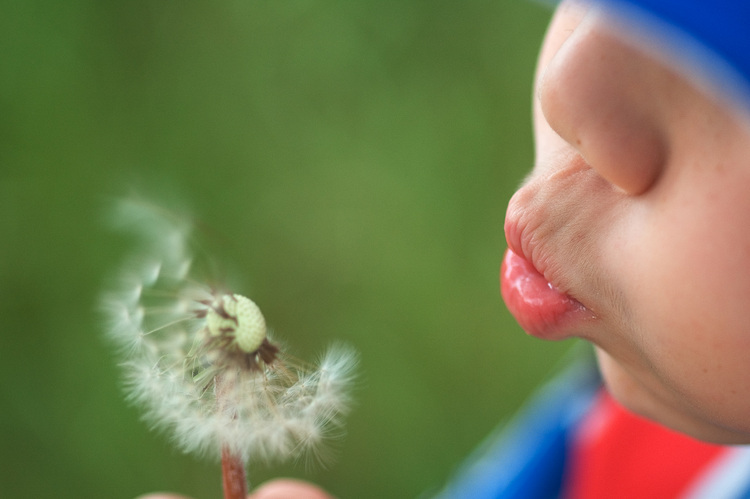 I think your "Make a wish dad" photo is so precious - and perfect to help convey my design concept. I was wondering if I may have your permission to use the photo on my concept board as part of a collage? This board is simply for a school project, it wouldn't be sold or used any other way. Please let me know, thank you! Hi, im elaine from indonesia. I love this picture so much..!! So Cool! I really like "dandelion flower"
Above all, i wondering that you make a great photograph.. keep movin!! My name is Troy Christiansen. Each year we sponsor a golf tournament for the benefit of Make-A-Wish of Oregon. Make-A-Wish grants the wishes of children with life threatening medical issues, in an effort to make a difference in their lives during a difficult time. I would like to use your image, make-a-wish-dad, in our golf invitation with your permission. It would involve about 150 invitations that we print. Please let me know if we could use the image. I'm borrowing this picture for my blog. Thank you for taking it. It's awesome. I used this image for a post related to Make a wish foundation in my blog. I would like to use your photograph "Make a Wish Dad" on a non profit animal rescue site. May I please have your permission to do so? Thank you so kindly for your time and consideration. BTW...the photo is FANTASTIC. Great composition, color, cropping. Really do love it.